"When you stand with your opponent and he looks into your eyes, the contrast of the blue with the blue and whites of my eyes - it's quite menacing." With his face and long beard painted the colours of the saltire, Scotland's Paul Craig looks the part. 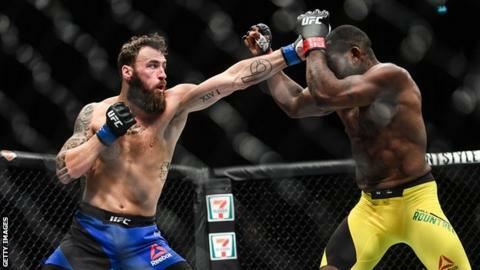 The 31-year-old Coatbridge UFC fighter faces Nigerian-born Texan Kennedy Nzechukwu in Philadelphia on Saturday night in a light heavyweight battle. Craig tells BBC Scotland about being jet-lagged in the octagon, how this upcoming fight was inspired by a television character, and how he is too polite for trash talk. Craig goes into the fight under significant pressure, having lost three of his last five fights. The most recent came after submitting Australian Jim Crute in December. The result, he says, was down to jet lag after the 27-hour journey to Adelaide meant his "engine gave up". "It's like a grieving process, losing," he says. "I know that sounds a bit silly but that's what it's like, you grieve. Another loss on your record can be devastating to your life - you might not have a job anymore." Knowing UFC life can be short, Craig admits he treats every fight like it could be his last, even if that oppressive state of mind can take a toll. "I know it's quite negative, but it's a good way to motivate yourself because I'm living a dream. The UFC wants the best opponents and if you're not putting on a show then they UFC is going to drop you. "Having it hanging over your head that you might not be able to provide for your family, it does get you down. But you can't dwell on it. The grieving has to stop and you move on. As long as you've got people round about you it's easier not to slip into the darkness." Craig is a fan of American sitcom It's Always Sunny in Philadelphia, whose writer and one of the main characters 'Mac' is a fan of mixed martial arts (MMA), and the show is partly responsible for his latest fight. "The earth just works in these ways. I've got a feeling about this, this has happened for a reason." Craig has been acclimatising himself with the city since arriving earlier in the week, taking inspiration from Rocky with the obligatory run up the 'Rocky Steps' seen in the film and yelling "Yo, Adrian!" But he has only encountered the man he is here to fight very briefly, in an awkward elevator journey. "I think he wanted me to wait in the lobby so he could go himself but I piled in - I could feel his tension," says Craig. Nzechukwu, 26, is unbeaten but this is his first appearance at this rarefied level. And Craig fancies his chances against a man known as the 'African Savage'. "He's not fought in the UFC before, under the bright lights, and that's quite an intense thing," Craig said of his 6ft 5in opponent. "Kennedy is very, very raw and sometimes rawness doesn't work when you're up against somebody who's skilled. "I'm a very high-level grappler, so wrestling, jui-jitsu, and use a lot of my energy trying to get submissions because I don't want a boring fight. But I would like a knockout on my professional record." While Scottish Hit Squad member Craig admits there has been pressure to him move to the United States, he has no intention of leaving Scotland or the gym where his coach and team "will back me to the hilt" both in and out of the octagon. It does not mean he is not ambitious - far from it. But Craig, who signed a four-year UFC contract last year, believes in living in the moment and making a name for Scottish MMA. "I could move to Vegas and ship my whole family out there and have the best of everything and replace all the coaches I've got, but there's a sort of family in my gym where my coaches look after me," he says. "A lot of people think because we're Scottish we don't have the facilities, the coaches, the ability and nicety - but I like that about Scotland." And Craig knows that he could easily be chewed up and spat out in the "fickle" world of UFC Stateside, where you can go from big name to scrap heap in the space of one fight. "It's hard," he says. "You could be having a great run and beating everybody, but you need to entertain and I'm not the kind of guy who'll insult people and be brash, it's not in my character. But that's what people want to see and I understand that, we grew up on the WWE wrestling culture and we expect that to happen." That explains the blue war paint on fight nights. "It shows people who you are. In a sport of hundreds of fighters, it's how you stand out without insulting people."